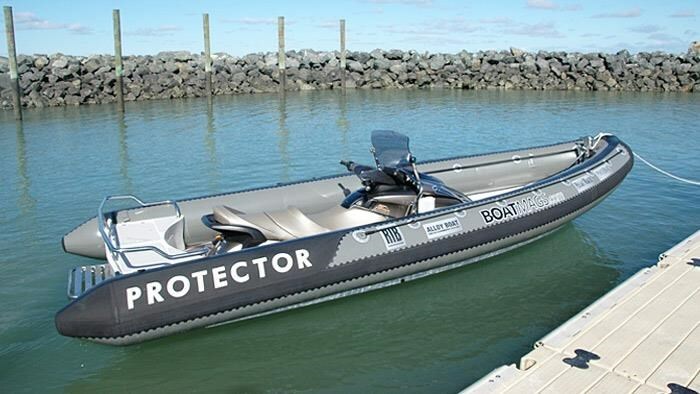 Rayglass Boats have always come up with innovative ideas and its new Protector Pro-Jet is no exception. Its completely different to anything seen before, successfully combining a Yamaha personal watercraft and an RIB into one intelligently engineered package. This is no ordinary jet boat and while it delivers all the best attributes of a jet boat and that of an RIB. This is also a boat that will find plenty of use as a general all-purpose RIB suitable for fishing, diving, towing water toys and its natural home as a super yacht tender. Designed to carry up to 5 passengers. Powered with a supercharged 1800cc 4 stroke. Hyaplon tubes, UV & petroleum resistant. Grab ropes fitted to outside tubes. One word describes driving the Projet Fun. Used ONLY 117hours in ONLY fresh water. This compact hard top from Rayglass Boats continues a tradition of superbly finished boats combining practicality, comfort and style. Also available in a soft top option, The Rayglass Legend 2200 is a lot of boat squeezed into an easily managed and easily towed package. With the Legend 2200 Rayglass has produced a sleak sub 7m hard top that looks and feels like a bigger boat.